3 things to look forward to at Ireland's creative conference. 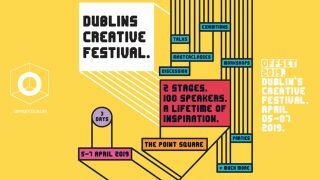 OFFSET Dublin's 2019 is nearly upon us, and this year looks set to be better than ever, as the creative conference celebrates its 10th anniversary. The conference takes place 5-7 April at The Point Square, Dublin, and early bird tickets are still on sale – buy your tickets to OFFSET here. OFFSET is known for curating stellar line-ups from across the creative industries, and this year is no exception. There are too many cool speakers to mention here, and more are still to be announced, but we're particularly looking forward to seeing design legend Lance Wyman, type genius Ariane Spanier and advertising gurus Alexander Nowak and Felix Richter of DROGA5. Other big names include Edel Rodriguez, Yumi Suzaki of Pentagram and James Victore. OFFSET's fringe festival, OFFSITE, is also worth checking out. Details of this year's events have yet to be announced, but last year saw workshops, exhibitions and panel talks take place across the city in the days around the festival. These events are often when you can get up close and personal with your heroes, as well as swap tips and tricks with other OFFSET attendees, so stay tuned for more details. OFFSET directors Lisa Haran and Bren Byrne have recently been awarded the IDI President's Award for Outstanding Contribution to Design at the 2019 Irish Design Awards, and their commitment to the creative community shows at OFFSET. The creative buzz around the event, and Dublin's general fun atmosphere means your time at OFFSET is bound to be exciting, inspiring and sociable. Buy your tickets for OFFSET here.